1. Hugh Nibley, The Prophetic Book of Mormon (Salt Lake City and Provo, UT: Deseret Book and FARMS, 1989), vii. It should be noted that Welch was trying, in his own words, to capture Hugh Nibley’s vision and understanding of the Book of Mormon’s prophetic nature. 2. See Book of Mormon Central, “Why Was It Significant that Nephi Was Made ‘a Ruler and a Teacher’ Over His Brethren? (1 Nephi 2:22),” KnoWhy 462 (August 28, 2018). The importance of Nephi’s status as a ruler held political significance for his posterity for generations. See Noel B. Reynolds, “Nephi’s Political Testament,” in Rediscovering the Book of Mormon: Insights You May Have Missed Before, ed. John L. Sorenson and Melvin J. Thorne (Salt Lake City, UT: Deseret Book, 1991), 221. See also, Noel B. Reynolds, “The Political Dimension in Nephi’s Small Plates,” BYU Studies Quarterly 27, no. 4 (1987): 15–37. For specific stories that foreshadowed Nephi’s status as a ruler and a teacher, see Book of Mormon Central, “Why Was the Sword of Laban So Important to Nephite Leaders? (Words of Mormon 1:13),” KnoWhy 411 (February 27, 2018); Book of Mormon Central, “Why Did Nephi Include the Story of the Broken Bow? (1 Nephi 16:23),” KnoWhy 421 (April 3, 2018). 3. Steven L. Olsen, “Prophecy and History: Structuring the Abridgment of the Nephite Records,” Journal of Book of Mormon Studies 15, no. 1 (2006): 28. 4. Olsen, “Prophecy and History,” 28. 5. For a short treatment of these prophecies, see Grant Hardy, Understanding the Book of Mormon: A Reader’s Guide (New York: NY: Oxford University Press, 2010), 112–113. It seems likely that these prophecies were given in the context of a Pentecost celebration. See Book of Mormon Central, “Did Abinadi Prophesy During Pentecost? (Mosiah 13:5),” KnoWhy 90 (May 2, 2016). 6. 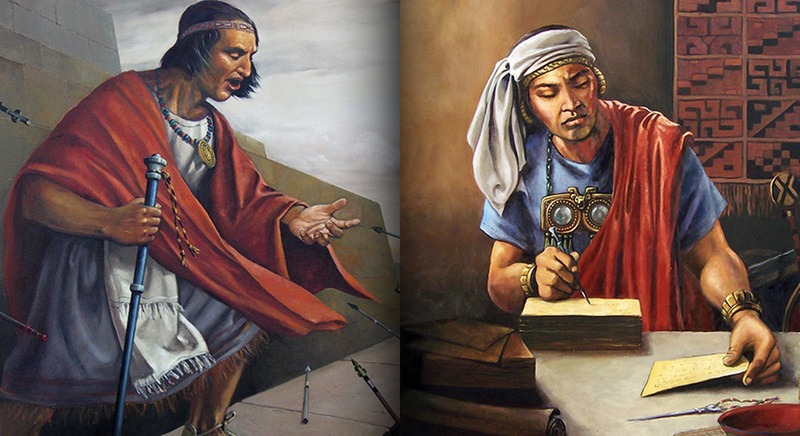 See Book of Mormon Central, “Why did Samuel Rely So Heavily on the Words of Past Prophets? (Helaman 14:1),” KnoWhy 185 (September 12, 2016); Shon Hopkin and John Hilton III, “Samuel’s Reliance on Biblical Language,” Journal of Book of Mormon Studies 24 (2015): 31–52; John W. Welch, “Textual Consistency,” in Reexploring the Book of Mormon: A Decade of New Research, ed. John W. Welch (Salt Lake City and Provo, UT: Deseret Book and FARMS, 1992), 21–23; Quinten Barney, “Samuel the Lamanite, Christ, and Zenos: A Study of Intertextuality,” Interpreter: A Journal of Mormon Scripture 18 (2016): 159–70. For analysis of Samuel’s prophetic language, see Donald W. Parry, “‘Thus Saith the Lord’: Prophetic Language in Samuel’s Speech,” Journal of Book of Mormon Studies 1, no. 1 (1992): 181–183; S. Kent Brown, “The Prophetic Laments of Samuel the Lamanite,” in From Jerusalem to Zarahemla: Literary and Historical Studies of the Book of Mormon (Provo, UT: Religious Studies Center, 1998), 163–180. 7. See Book of Mormon Central, “Why Did Samuel Make Such Chronologically Precise Prophecies? (Helaman 13:5),” KnoWhy 184 (September 9, 2016). 8. See Melvin J. Thorne, “Complexity, Consistency, Ignorance, and Probabilities,” in Book of Mormon Authorship Revisited: The Evidence for Ancient Origins (Provo, UT: FARMS, 1997), 179–193; Book of Mormon Central, “Evidence of the Book of Mormon: Internal Complexity,” online at bookofmormoncentral.org. 9. For further evidence that an outline was likely used, see Brant A. Gardner, “Mormon’s Editorial Method and Meta-Message,” FARMS Review 21, no. 1 (2009): 84–87. 10. See Book of Mormon Central, “Why Did the Book of Mormon Come Forth as a Miracle? (2 Nephi 27:23),” KnoWhy 273 (February 10, 2017). 11. For example, the people of Ammonihah refused to believe that their city could be destroyed in a single day, but Mormon reported that this is exactly what happened (see Alma 9:4–5; cf. Alma 16:10). 12. Robert D. Hales, “Finding Faith in the Lord Jesus Christ,” Ensign, November 2004, online at lds.org. 13. For instance, see 2 Nephi 3:6–14. 14. The scriptures in the “Fulfillment” column were derived from John W. Welch and Gregory J. Welch, Charting the Book of Mormon: Visual Aids for Personal Study (Provo, UT: FARMS, 1999), 136. 15. For a possible solution to the apparent discrepancy in Samuel’s five-year prophecy, see Neal Rappleye, “‘The Time is Past’: A Note on Samuel’s Five-Year Prophecy,” Interpreter: A Journal of Mormon Scripture 29 (2018): 21–30.